I'm a few days late with this but I've been processing & packaging close to 100 pounds tuna & mahi and I'm down to my last 15 pounds so I can take a little break to tell the tale and put up some pictures. 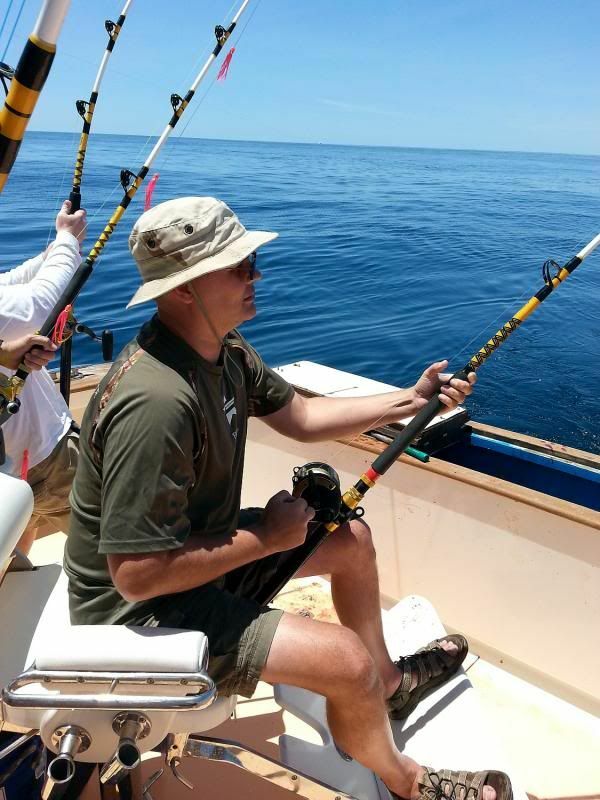 I was invited to fish with the Combat Warriors group this past Memorial Day. They do hunting and fishing events for combat & disabled veterans and I first hooked up with them this past December on a deer hunt that was co-sponsored by Freedom Alliance. I didn't get a deer, but I won a really nice crossbow in a raffle drawing. Because of that deer hunt, I was eligible to be put on their e-mail list for the upcoming year's events so I put in for 2 fishing trips. This offshore trip was originally scheduled for Saturday but the marine forecast called for 12 to 15 foot seas with 30 knot winds which is very miserable conditions and impossible for me to bear. The boats postponed the fishing until Monday and that worked out for the best in the end. I arrived late Sunday afternoon to meet everyone, have a nice dinner and get to bed early for a 0330 wake-up. Morning came early, but we all got up and 12 of us piled into 3 vehicles and drove the 45 minutes to the boat dock at the Outer Banks. We were evenly split between 3 charter boats and we left shore by 5am. I was on "The Qualifier" with Captain Finn and First Mate Chris. The seas were nearly flat with just a hint of a wind. 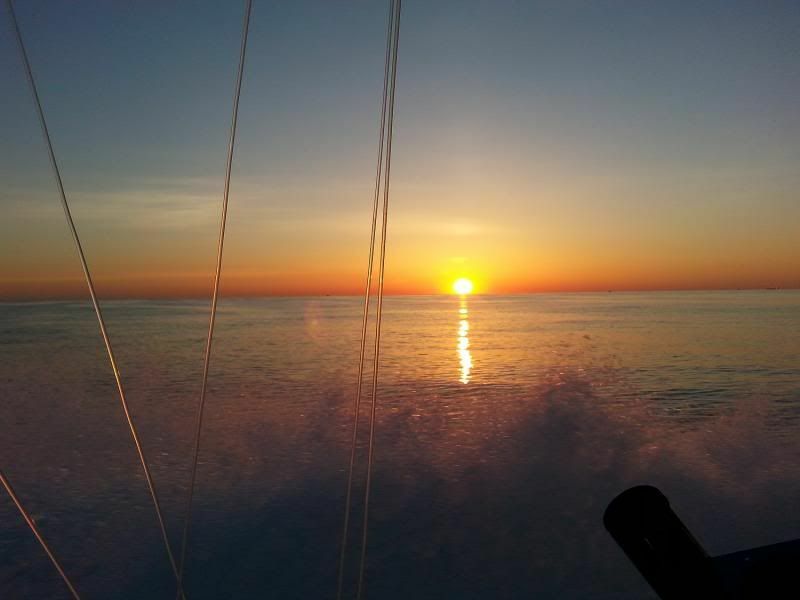 It was dark out when we left the dock, but we were graced with a beautiful sunrise during the near 2 hour trip out to the 80 mile mark. 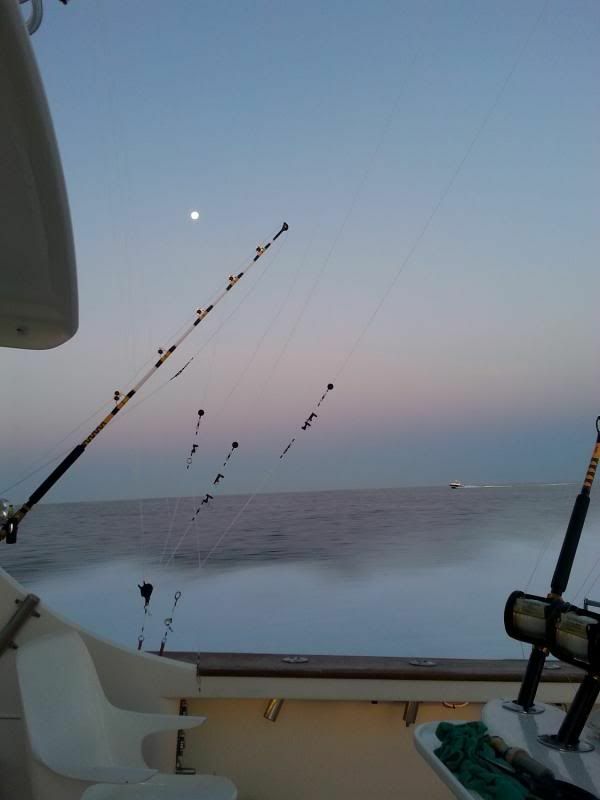 At one time the moon was still bright on the starboard side while the sun was rising on the port side. The boat is a first class vessel all the way. Measuring 63 feet she featured a spacious "living room" with a basic kitchen and down below had a full bathroom and sleeping quarters for a full crew. Up on deck Chris was rigging rods while most of us slept in the lounge. Once we got to the continental shelf (3300' depth), Capt Finn gave the word to Chris to put the lines out and the troll was on. We all rotated on the rods when there were single hookups but when multiple knockdowns happened it was the first person close enough to get handed a rod. It wasn't long before I hooked into my first mahi (I was 3rd in line for the first set of single hookups) and she was a scrappy 15 pounder. I was happy to get my first fish in the box which let me relax a little and not worry about getting skunked. Within the next hour we came upon a decent sized weed patch which is a great place to find mahi. We had a couple of multiple hookups and within 15 minutes I boated another 15 pounder and a 22 pound mahi. 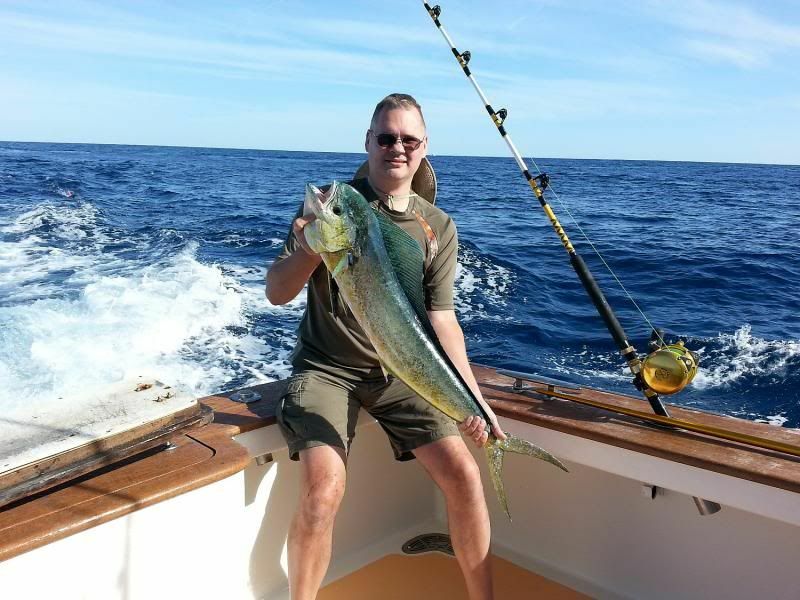 We were on and off with the mahi for most of the morning and during the down time we either caught a small cat nap, ate some snacks or just enjoyed the beautiful day. 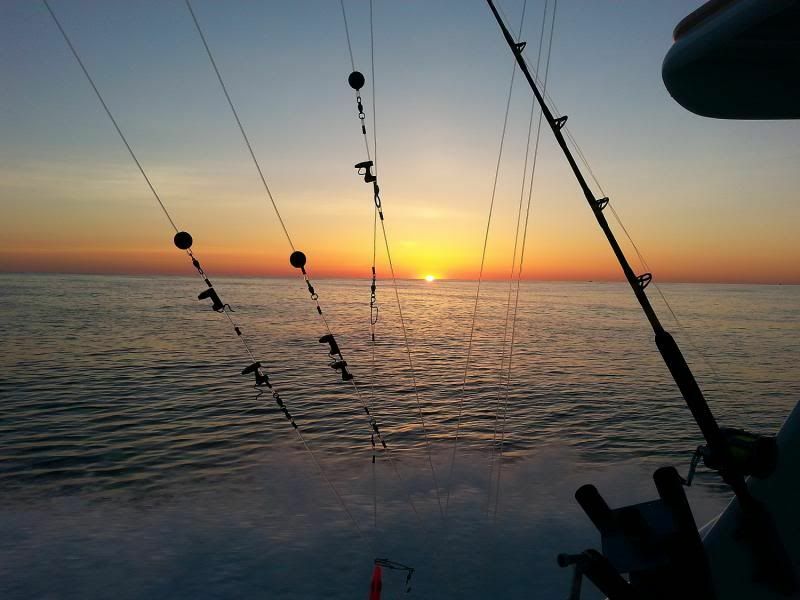 The day before the fishing reports were full of yellowfin tuna and I was wondering where they were and if we was going to get a chance to catch any. Chris set up all of the rods (all 8 of them!!) with surface baits & teasers (artificial squids & rigged dead ballyhoo) and no sooner than I was going to ask the mate why aren't there any diving lures Captain Finn spotted a school of tuna hunting on the surface. He guided the lines into the tail end of the school and all of a sudden 4 lines were screaming! We had a quad hookup of really decent sized tuna followed by orchestrated chaos on the deck to help prevent massive tangling. These just so happened to be the largest tuna of the day that we tangled with and our only full crew hookup. There were 3 fighting chairs and since I was the last to get handed a rod I spent the first 20 minutes in a stand up fight until the first tuna came over the stern. It was really nice to sit down and I was able to finally put the heat on the fish. I got her to the boat in about 10 minutes, but she wasn't done yet and in the end gave 5 runs at the boat and another 20 minutes before getting gaffed and tossed in the fish box. The first guy that hooked up was the last guy to bring in his fish after a 45 minute fight but his was the largest weighing in at the dock at 77 pounds and was citation size (mine weighed in at 65 pounds, the smallest of the 4 was 63 pounds). After that battle everyone was pretty wore out, but still wanting to catch more fish. 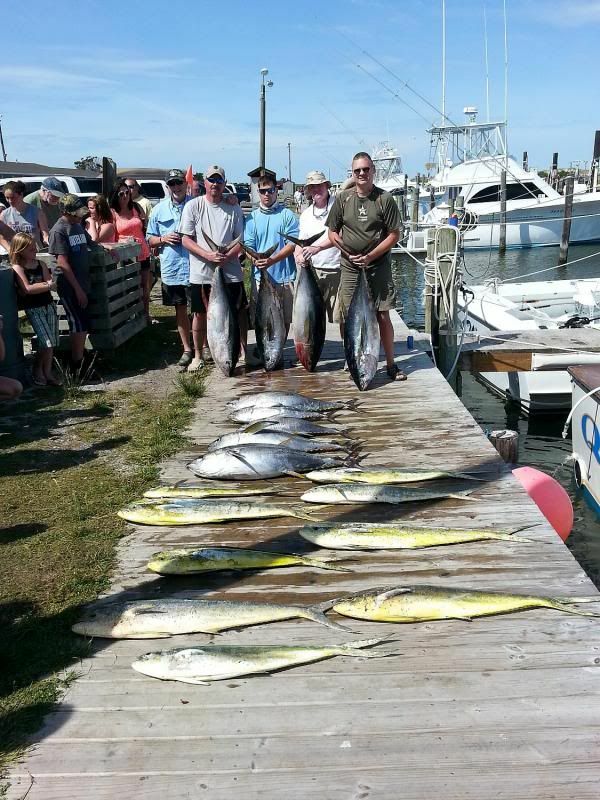 All in all at the end of the day I managed 4 mahi and 4 tuna out of 18 total fish boated with a gross weight of 515 pounds. 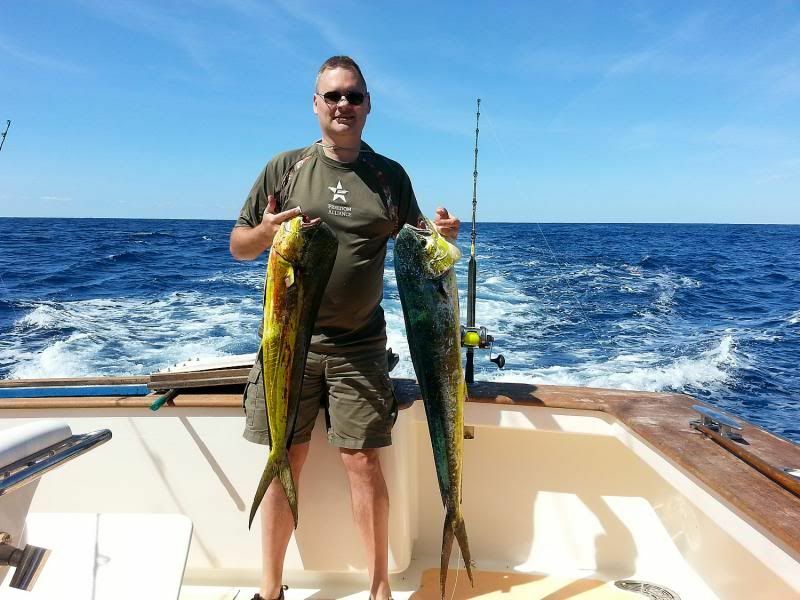 The other boats caught mahi but anchored up on some live bottom and added tilefish to the mix. One lucky guy brought a large white marlin to the boat, his first, which earned him a citation as well (and he was also thrown in the creek on the way in). We all had a great time and I was able to fish with one of the guys that I deer hunted (he got the citation tuna) and I was able to forget about my aches and pains for a while and also fill my freezer with a lot of tasty fish. I hit the percs hard that night, but it was so very worth it. I got another trip in the fall so hopefully that will be just as fun and successful. Good for you Matt !! What a catch !! Sushi and fish fry at Matt`s house. Call me for directions. 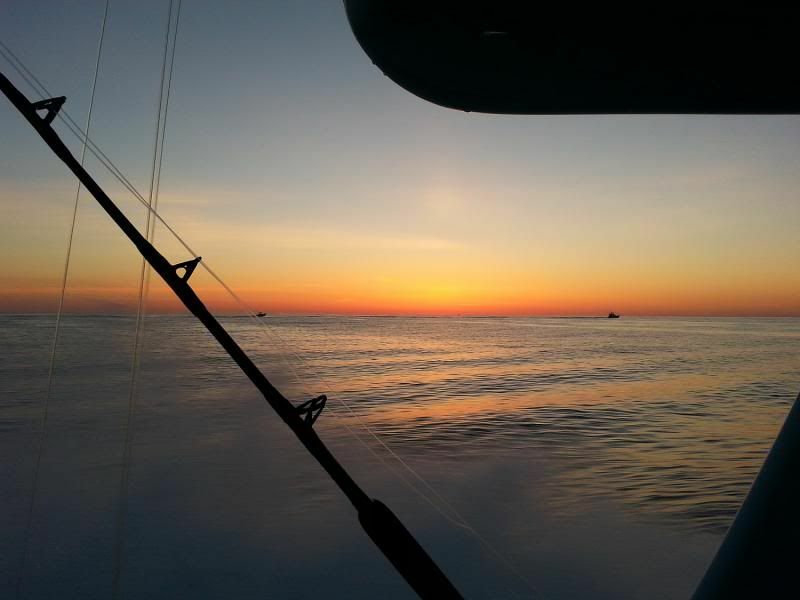 Glad the seas calmed and you were comfortable.How could you not be on a 63 foot sporty? Guess during down time you lounged in the air conditioned saloon in the stuffed leather chairs and sipped fruity drinks with plastic umbrellas while watching satellite TV. Rough. I often wondered what life was like on a big sporty when I was doing charters with my 26 center console. Your great photos have me missing being out there. Can just about smell the salt spray .